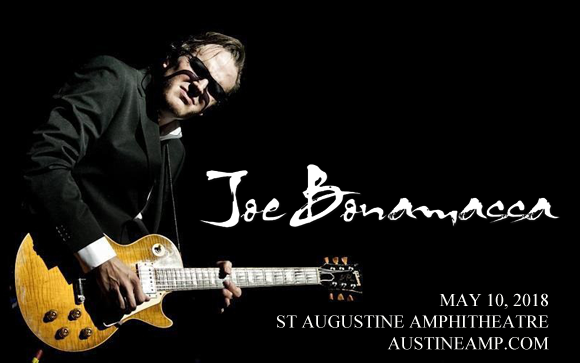 Blues-rock king and guitar god Joe Bonamassa comes to St Augustine Amphitheatre on Thursday 10th May 2018 for an event you will never forget! Joined by several world-class musicians, the virtuoso talent will be performing tracks from his album Blues of Desperation, as well as classic Bonamassa fan favorites! Indisputably one of the greatest guitar players in the world, blues virtuoso Joe Bonamassa was a child prodigy, who first picked up the instrument aged 4. By the time he reached 12, he was fronting his own band, Smokin' Joe Bonamassa, and that year he went on to perform as support for blues legend BB King at 20 shows across the US. As time passed, Bonamassa continued to perform alongside his heroes, including Stephen Stills, Eric Clapton, Blondie Chaplin, Foreigner, Buddy Guy, Steve Winwood, Warren Haynes, and Derek Trucks among others. He has released 12 studio albums to date, 11 of which have reached #1 on the Billboard Blues charts.